Skeleton lined for breathability and lightweight comfort. Leather and rubber outsole for improved flexibility and traction. Waiting to see if the rubber soles bear well wet weather. I have been searching for the perfect pair of loafers for the past 10 years. My quest has lead me to this beautiful shoes. The look and fit of the shoe is absolutely great. The feel comfortable, the leather is nice soft, the color looks radiant. Because I have worn this shoe for 52 years & do not want to change. You do not sell in in most retail stores. Quality replacement for squeaky Florsheim at a good price. It was my son's 26th birthday and he's a professional working in Cambridge MA. Nothing better than a classic loafer that goes w any color. And he has other Cole Hans that are super comfy! I have been wearing this style for years and I like the shoes. very comfortable fit. classic design. goes with just about any outfit. reasonable price. This shoe has the traditional design of the penny loafer. 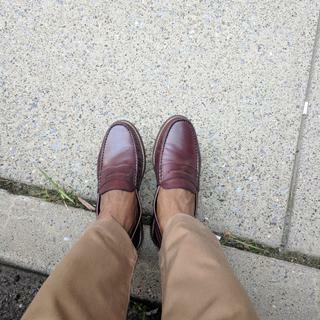 I need a modern twist on a classic design for loafers. CH's technology is described by my husband as making the Most comfortable shoes he has ever worn! These were featured on a t.v. segment about men's fashion, and since the first purchase years ago he won't wear any other brand. Looked ok online. Hopefully they will work. I have always loved the pinch penny style. Super comfortable to wear and very stylish. what's not to like!!?? Can wear with slacks and blazer or a suit. Versatile. I love the style and the color... Perfect summer shoes. my husband has a wide foot These usually fit well. 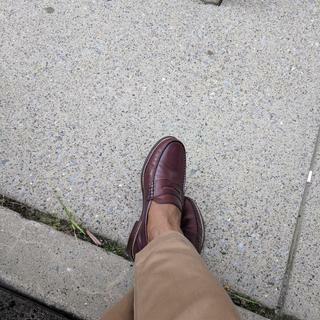 Cole Haan shoes fit me perfectly and last many, many years. Any plans to add more colors, specifically the blue and green from a few years back? BEST ANSWER: We don't have any advance notice of production plans, but safe to say that each Fall season brings new materials and colors into most of our footwear collections. Best advice is to cruise through the website regularly. New Fall 2018 styles will begin to appear in the coming weeks.